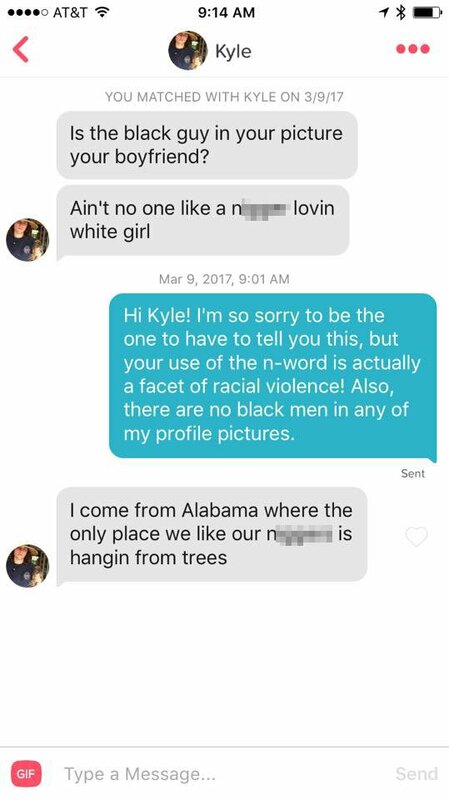 A University of Alabama student is under investigation after he sent racist and homophobic Tinder messages regarding a photo included in 20-year-old Emi Miller’s profile. 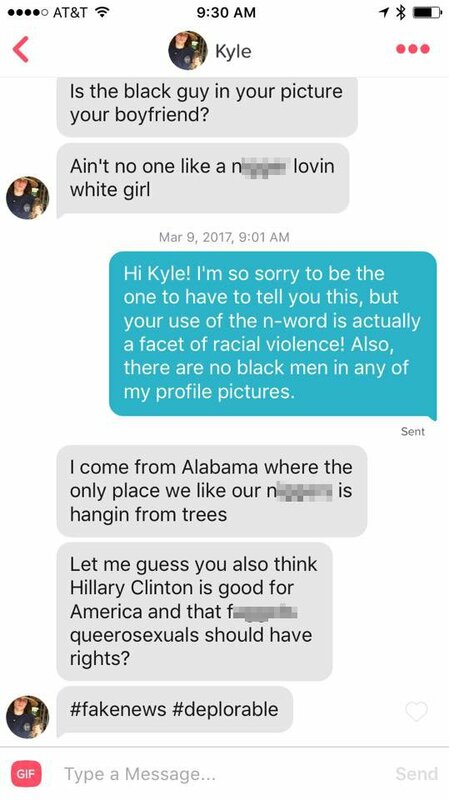 UA junior Kyle Harcourt sent Miller a series of disturbing messages using the n-word and homophobic slurs. Miller, who doesn’t go to UA, matched with Harcourt on Tinder on March 9th. “I think we might have swiped [on] each other while I was in DC for an internship over January.” She saw his messages last Thursday morning before her first class. Miller said, “When I first saw the message, asking about the African American man in my profile picture and calling me a ‘n***** lovin’ white girl,’ I was initially confused and shocked. Confused, because I don’t have any photos with an African American man on my profile. His following messages were even more disturbing. He said, “I come from Alabama where the only place we like our n****rs is hangin from trees,” and then included a message using the word “f****t and other anti-LGBTQ language. Miller then posted the photos, as well as a screenshot of his Tinder profile, on Twitter and Facebook. Harcourt’s profile said he is a junior at UA and included the Greek letters for Sigma Pi fraternity, so Miller tagged the University of Alabama, the national Sigma Pi fraternity organization and the local Alabama chapter in her tweets. The tweet and photos quickly went viral, and the two organizations she tagged replied almost immediately via Twitter and email. UA said they initiated a “disciplinary review through the Office of Student Conduct.” Miller also spoke with UA’s Office of Student Conduct over the phone. Sigma Pi’s national body said Harcourt was suspended from the fraternity in January and is no longer a member. The individual who sent those messages is no longer a member of Sigma Pi. We condemn all intolerant behavior & attitudes.